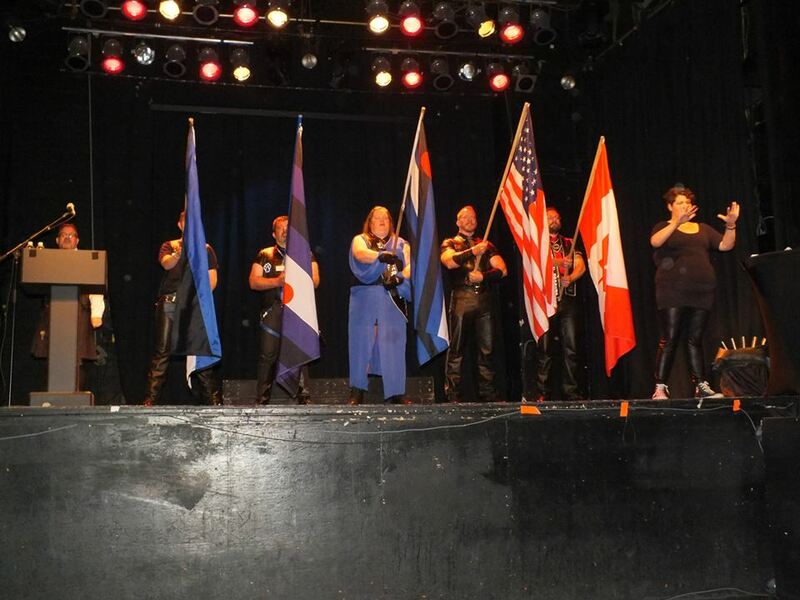 This year, I saw Toronto’s Leather Pride from a completely different angle… and that was from the inside, as a contestant in Mr Leatherman Toronto 2016. The experience was both wonderful and intense, and a great eye opener into all that the leather community does, not just for one another but for the Queer Community as a whole. The whole whirlwind started on Thursday night at Crews & Tangos where we said our goodbye’s to last years title holders, Brett and Luca, and relived some memories of their experiences. Friday had us attending the VIP Reception and then the first of the Puppy Judging, as well as the “Meet the Meat”, hosted by Carlotta Carlisle over at Woody’s. Both nights had after parties at the Black Eagle. But the real adrenaline came on Saturday… a full days of nerves and stress as my fellow contestants and I started our morning off with one-on-one interviews with the eight highly esteemed judges… After that it was down to the Phoenix for rehearsals, preparation and frequent urination due to nerves… all in preparation for the big night. The contest itself had us partaking in two different divisions. We all started with formal wear and a speech that was not to exceed two minutes. The funny thing is, I don’t remember what I said or how long I went for, but it felt like thirty seconds. The next scene was minimal wear and the Pups got a fantasy scene. Part of minimal wear was that we all had to pick a random envelope, which had a question for us to answer to see how we think on our feet… and then, like a flash, we’re all back on stage for the announcement of the winners. Starting with the Pups, we all waited in bated breath as the three Pups, Omega, Red Rex and Benny, waited patiently for the results. First runner up was Red Rex followed by the winner, Pup Benny! Miss Leather Toronto had it the hardest I would say, because, as the only female contestant, she was competing against numbers and the ideal, not other competitors. It’s happened before many times when the single contestant did not win because they were shy on points. Shahrazad and I had become close since day one, and I held my breath as they opened the envelope to say if she had won… and she did! I think the biggest shock was the moment my name was called as Mr Leatherman Toronto 2016. I truly and honestly was not expecting it. The whole experience has been so amazing, with great friends made and lessons learned. And for me, the biggest has been that after so long in Canada alone, I feel I have a family now and somewhere I truly belong. I need to thank INspired Media Inc. and theBUZZ Magazine for sponsoring me and believing in me, as well as all my contestants and peers who have shown nothing but love and support, as well as encouragement. Masters T’Hayla and Brad, for their continued support and guidance. And my title family, Shahrazad and Pup Benny, who walk this journey with me. A special thanks to Paul Ciantar for the photography and images used in this article. 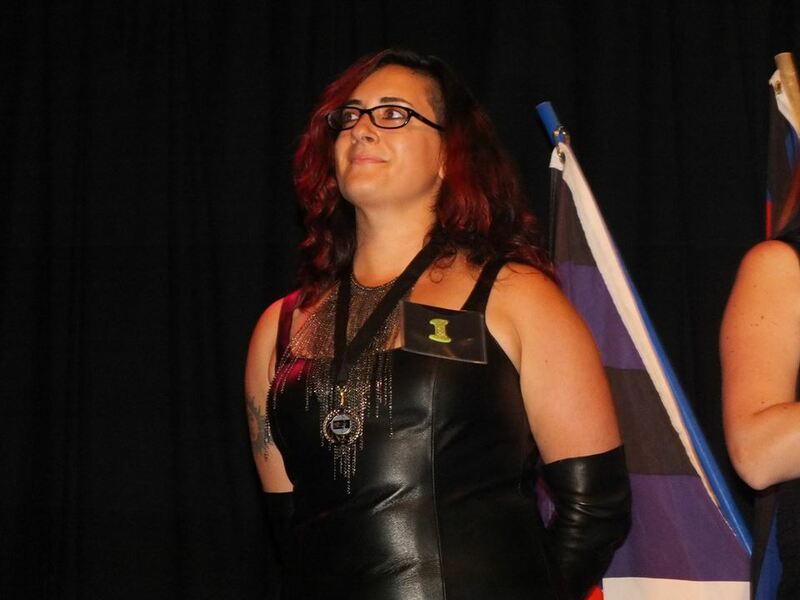 I couldn’t be prouder to be Ms Leather Toronto 2016, and I will do everything in my power to serve this community and bring women’s voices ever more strongly into the gestalt of the larger leather community. To T’Hayla Ferguson and Brad Zahlen at Heart of the Flag Federation (HOTFF), and the contest judges Master Jack Pearce, Daddy Ray Tilton, Enza Silano, Patty, Karl Couture, Jo Ryan, and Pup Ego, and Bob Miller (each of whom is an inspiration in their own right), I thank you for the support, the challenges, and the insights that helped me learn more about myself, and for the care and love with which you embraced your roles. To the outgoing titleholders Brett Murden, Luca, and Sprocket, I appreciate that it must be hard for you to move on. The vast positive impact you had on this community and your commitment to it is very apparent. Your tidbits of earned wisdom at the competition weekend were invaluable.To the incredible men in my leather class whom I am grateful to have met – Craig Goodenough, David J. Knott, Brandon Wallans, Jeremy Feist, Winston Stuart Langley, and Red Rex, you each shone this weekend. The experience was way more fun having gone through it with all of you. To my new leather husband Brandon Michael Lee and our leather puppy, Pup Benny, I look forward to a year of positive change and transformation – within ourselves, together as a family, and in our contributions to the larger community. I love you both very much! To all of the board members, past and current titleholders near and far, community members and allies who came and introduced yourselves…the pleasure was all mine. I hope I do you proud. Finally to George, my life partner and soulmate, thank you for loving me for exactly the nutbar I am. You’re the best. Thank you to everyone who’s supported me throughout this incredible weekend. To Master T’Hayla Ferguson, Brad Zahlen, everyone at HOTF, and all of our incredible judges on the 2015 panel, thank you for trusting me with this title. To papa Sprocket and grandpa Ego, I’ll do all I can as your successor to make you proud. To the wonder pup Shallis, for working diligently to be there for me every time I needed you, and for being the only pup capable of pulling off what we made together, thank you. Den Daddy Brett and Den Mummy Luca, MLT and MsLT 2014, your guidance was invaluable to me, as was every quieting hug. To my friends, pup Red Rex and Fenn, were it not for you the distinct smell of old vomit backstage may very well have been refreshed. Argo and the BEKK, you’ve made the significance of a pack crystal clear. And, of course my partner, Aaron, I could have done this without you. I have an incredible amount of love and respect for all of you. Nerve wracking as it may have been, I know that the experiences and opportunities that have come with running for Toronto Puppy will undoubtedly serve me for the rest of my life. I would do it all again if it meant making the friends I’ve made, and learning all that I know now about myself. To my new family, MsLT Shahrazad and MLT Brandon, while I may only have known each of you for a short time, I already love the both of you dearly. So what else can you expect from a puppy? I cannot wait to see what we accomplish together. And now for some photos from the week!!! Enjoy!! !